What would you give to relive the greatest moments in your gaming history as if it were the first time? That's the question commenter Taggart451 ponders in today's Speak-Up on Kotaku. WARNING: Spoilers ahead. As a person who has been playing games my entire life, I constantly play new ones, but I find old ones that I still go back to and enjoy. Kirby's Adventure on the NES or Mega Man. I've got a Chrono Trigger New Game+ file that is still from the first time I ever played and I just keep adding onto. Banjo-Kazooie is still some great platforming. But something's really been getting to me lately. What would you do if you could play all those games again for the first time. Not know everything already going into it. Imagine. Ducking behind the white block in level 1-3 in Mario 3 and discovering the warp whistle. 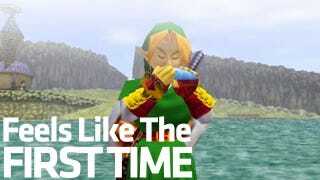 Going through the Water Temple again in Ocarina of Time. Hell, the whole game itself. Not knowing that Aeris would die. Rediscovering that YOU are Darth Revan. Not knowing every single secret in the aforementioned Banjo-Kazooie. System-Shock 2 or Bioshock and not knowing that the character you had been guided by is actually the villain. The list goes on and on. As gamers we long for these new and exciting experiences. The old games still make us feel good. That's why we go back to them. But we automatically know where all the secrets are, all the patterns, and the story. I tell you there is nothing like picking up a new game and having something unexpected happen. To have something tug at your heart in a new way that you didn't know you had.